It is easy to accuse politicians with corruption charges but it is impossible to prove it such as the Overpricing allegations to V.P. Jejomar Binay when he was major of Makati and now to Junjun Binay who is the incumbent mayor. It is not stated in RA 9184 Procurement law the limit on the number of bidders per project. All bidders for government projects are posted in PHILGEPS – which will last for 7 days. Even if there’s only one bidder, the bidding will still push through. If that only one bidder will qualify in the financial and technical aspects of the government requirements then, the project will be awarded to such bidder. According to COST Philippines ;Procurement is commonly defined as the acquisition of appropriate goods and/or services at the best possible price to meet the needs of the purchaser in terms of quality and quantity, time and location. The procurement process formally starts from the point where the need to make a purchase to deliver an objective has been identified, and its process ends when the product has been used up or sold, or the service contract has been delivered completely and the supplier or contractor is paid in full. As per RA 9184 this step by step must be followed to accomplish the certification of compliance for the winning bidder: 1. Preprocurement conference. 2. Posting of bidding documents to PHILGEPS, newspaper of nationwide circulation, website ng lgu, and 3 conspicuos places. 3. Pre-bid conference. 4. Opening of bids. 5. Bid evaluation 6. Post qualification. 7. Awarding of contracts 8. Contract signing 9. Implementation. Note: in every stage of procurement process there are 3 observers, one from COA, another from an NGO and one from the group that is knowledgeable on the nature if procurement so for Infrastructure representation for example, representatives from the Engineers Association and PICE will do. Anomalies in a government project can be rooted from the allowable 10% margin by COA – but the publicized values of the questionable Makati buildings are beyond the 10% add on as a safety measure. So, there’s a big chance that the amounts flashed via Tri-media have no basis. If the technical specifications are not followed to be able to pocket the allowed budget, then it’s now the engineering department that can be questioned for that – not the mayor. How to Properly Check Anomaly in a Makati Building? A mere comparison of the total project cost will not hold a chance to discredit a mayor. The detailed engineering design must be scrutinized. If the specification is not followed, perhaps there’s a bit of anomaly but if just comparing one building to the other, it will not prove anything. However, engineers and architects will be against altered specifications because if their project is sub-standard, their license is at stake. All they do is follow the government guidelines as issued by government agencies like DPWH. Whoever wanted to lower the budget of a project, they can do so by convincing COA to lower the 10% SOP allowance. DPWH can also minimize indirect costs. POW can monitor volume discounts on materials. So Private and Public Projects will not be comparable to each other. Even one public building is not comparable to another public building because each project is unique due to factors like land quality, real estate rate based on location and many more aspects of the project. Those who have questions on overpricing in any of the Makati buildings, they can channel their inquiries to the Commission on Audit. There are many technicalities involved in such projects – that is why, Binay detractors choose this kind of allegations to influence the public on their accusations. No one will thoroughly check on this until now! 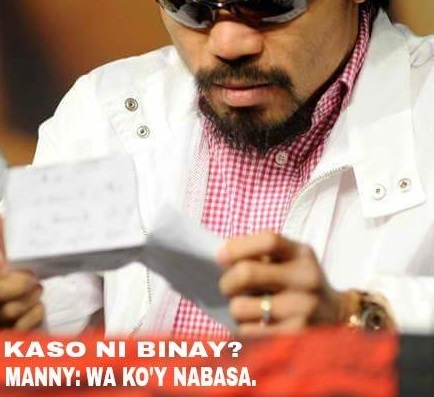 So, the Binays are innocent and Manny Pacquiao knows that – that’s why he is running as Senator alongside UNA’s presidential candidate: Vice President Jejomar Binay. Philippine politicians knew better that Vice President Jejomar Binay cannot be guilty of corruption because they themselves experience how to run their territory using the allocated budget from the Bureau of Treasury. The Bureau of Treasury (BTr) manages the finances of the government. It maximizes revenue collected and minimizes spending for sustainability. Tax collections are strictly profiled with standard rates and audited by COA or Commission on Audit. So, despite Makati being praised by its high tax collections and became an envy of other cities, the collected tax amount does not go to Makati alone. The Binays are just noted to efficiently set-up systems that give convenience to their tax payers and provide business-friendly infrastructures in the community hence the rising tax collections – but they do not have access to the tax monies. On the other hand, the distribution of tax revenues are also controlled by the National Treasury for the expenses in running a place as categorized into province, municipality, city or barangay according to the Department of Budget and Management. Perhaps either the senators accusing the Binays of corruption do not really understand the system or they just pretended not to know to fool the people in their quest to discredit the Binays and hopefully lower his trust rating? Makati’s commercial-friendly environment and development of the residents’ better living condition than the rest of the Filipinos are therefore really the proofs of the effective private-public partnership strategy to fund such projects of V.P. 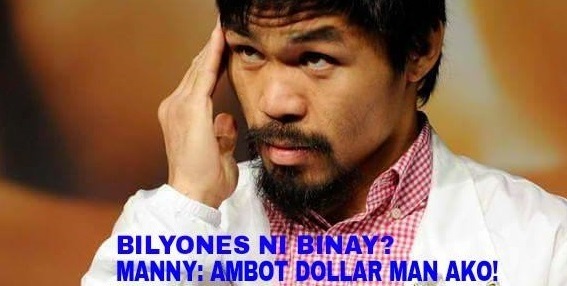 Binay as per his quote; by experience, at the local level, no revenue no project, hence bad economy at the national level – and Manny Pacquiao also shared the same view with Binay. Manny is running for senator under the United Nationalists Party of the Vice President. 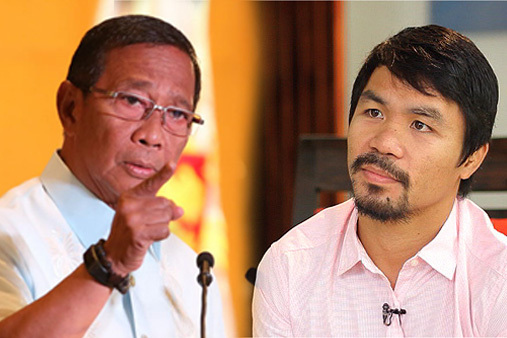 Vice President Jejomar Binay’s response to the kind words of Manny Pacquiao on his revived comments from ABS CBN: that the Vice President is not a “user” and he is confident that he can ease help poverty in the Philippines – being poor himself who managed to emerge from poverty through hard and smart works as a strategist himself while he promotes the preservation of human rights for the welfare of his countrymen. 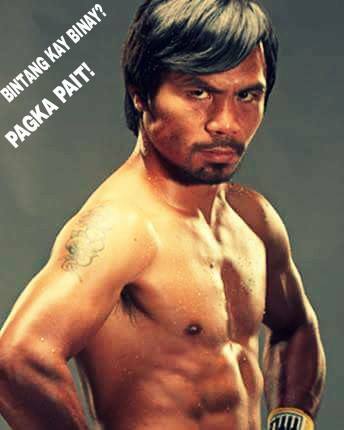 Manny Pacquiao is not just a boxer but a legend himself for the Filipinos and for all people around the world regardless of nationality. He was actually referring to Manny Pacquiao and not Manny Pangilinan when he said that he wants a successful businessman as running mate because at the local level, no revenue no project based on his experience. Apart from being a businessman, he has done many projects for the benefit of his constituents – and inspiring them to equip themselves with skills and nurture their talents to alleviate themselves from poverty with the help of his sponsored programs and facilities.There are many more achievements that Manny Pacquiao managed to fulfill that must be followed by those who wants to be successful through hard work, perseverance and following God’s guidance – making him a legend on his own rights! However, he ended up to be the very first senartoial bet that UNA disclosed since he is only 36 years old that falls short with the 40 mark in the Vice Presidency requirement. He supported the pro-poor political platform of V.P. Jejomar Binay. They are indeed the best bets for the Presidential and Senatorial race to help ease poverty in the Philippines. 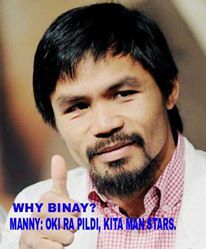 Manny Pacquiao said in the previous interview with ABS CBN: a real leader focuses on what the people need. He said a real leader will not use others to boost his chances of claiming a higher position – shrugging off the corruption allegations against him. Manny is not worried about the ongoing senate probe handled by the Blue Ribbon Committee to investigate Vice President Jejomar Binay. He knew ever since that Binay has been the champion in helping remote provinces especially for those who can’t have decent dwellings. He also stressed the fact that Binay is a self-made man who was able to move himself out of poverty – so, he is the most suitable candidate for the Presidency to help ease poverty in the Philippines. However, he was just proclaimed earlier during the Launch of UNA in Makati as it’s senartoial bet. Manny shared the views of the Vice President as elaborated in the political platform of Binay. Their being pro-poor made them the best bets for the Presidential and Senatorial race. Manny Pacquiao agreed with the political platform of Vice President Binay. For one thing, they both see eye to eye that helping to ease property in the Philippines should be a priority making them the best bets for the Presidential and Senatorial race.